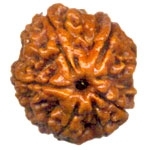 4-Mukhi Rudraksha Bead represents Brahma, the four headed God. Brahma is one of the three powers of universe. It symbolizes creation. 4 Mukhi Rudraksh Bead is said to improve mental power and wisdom. Four Mukhi is suitable for intellectuals, artists, scientists, writers, students, teachers etc to improve knowledge and concentration.4 Mukhi Rudraksh is also suitable for people who need to sharpen there mental skills for better learning and interpretation. The ruling planet of 4 Mukhi Rudraksha is Mercury. According to astrology wearing or keeping a 4 Mukhi Rudrasha with you pacifies planet Mercury and provides benefits associated with Mercury. Mercury itself represents and effects power related to mind, logic and thinking.